I have never been on a demonstration at 9am on a Tuesday morning before. Would everybody else be at work or in bed? Would more than 2 people and a dog turn up? But my worries were small compared to the anxiety that Marian was feeling today. Marian Machekanyanga is a Zimbabwean asylum seeker living in Sheffield. Marian was called by the Home Office to report at Vulcan House (the local branch of the Home Office in Sheffield) at 9am. The last time she reported at Vulcan House she – and other people – were questioned by a Zimbabwean Embassy official, invited there by the Home Office. Two Zimbabweans were detained and sent to Morton Hall detention centre straight after, threatened with deportation to Zimbabwe where violence against political opponents is at its worst for many years. Marian and others Zimbabwean asylum seekers asked for support. So South Yorkshire Migration and Asylum Action Group (SYMAAG) organised a demonstration outside Vulcan House, at the same time Marian was inside reporting to the Home Office, fearing that she might never come out of the front door. The response was big, even by Sheffield standards. 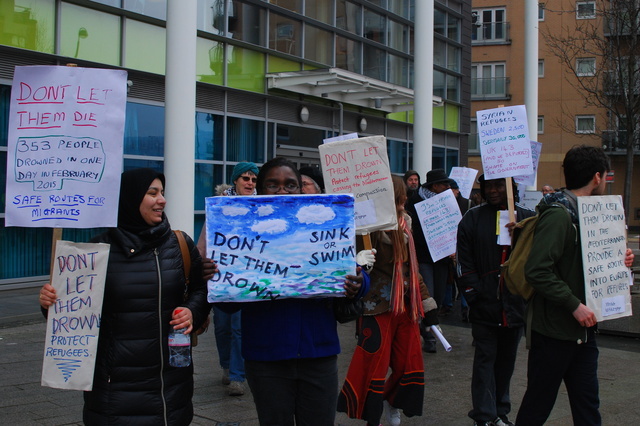 200 people chanted “Marian belongs in Sheffield” “No deportations to Zimbabwe” while security staff at the Home Office reporting centre looked out sheepishly. Marian was inside for just a few minutes and came out of the front door to cheers. “I’m not frightened anymore” Marian told the crowd, going on to say that she was humbled by the support she’d had and telling us how she loved Sheffield. But Marian reminded us that other Zimbabwean asylum seekers – including Khuzani Ndlovu and Benji Gudza – were still detained at Morton Hall under threat of deportation. Victor Mujakachi spoke next. Victor had also been detained and released after a campaign by his many friends and supporters – a petition for his release has gathered a remarkable 75,000 signatures in a week. He stressed the need to support others detained at Morton Hall who were less well-known and connected than him. Other speakers including Phillis Andrew from SYMAAG talked from personal experience about what detention centres are and how they are some of the most hostile places in the hostile environment for people seeking asylum. The apparent cosiness between the UK government and Zimbabwean dictatorship was a theme for other speakers. So what did we achieve today? Marian is safe for now, she’s laughing with her friends and eating carrot cake downstairs at The Sanctuary asylum seeker drop in as I write this. But she’s due to report at Vulcan House within 2 weeks. Victor was released. It took a campaign combining public protests, parliamentary questions, legal support, national media coverage including a very brave Channel 4 interview, a Guardian newspaper front page, a feature in the Independent, widespread local media and a social media campaign which reached new audiences. But there are still Zimbabwean people in detention. The Home Office has invited Zimbabwean Embassy officials to question Zimbabwean asylum seekers around the country. The UK government has still not – as it did between 2002 and 2010 – suspended deportations to Zimbabwe because of ‘political and humanitarian factors’ there. I think the most important thing this week’s campaign has achieved is how we have surprised ourselves: 200 people did turn out to a morning demo in the winter, perhaps we underestimate support for refugees; Marian and others – for the first time in their lives – have told their story in national TV and newspaper interviews; the Home Office are clearly disturbed by the intensity and reach of our campaign. Victor was released from detention. Refugees in SYMAAG and other organisations have spoken out with a new confidence and authority. The Home Office’s ongoing attempt to detain and deport high-profile, much-loved activists to Zimbabwe at a time when it is patently not safe felt like a challenge. I’m pleased we rose to that challenge this last week. I hope that the energy and optimism generated is the basis for future campaigns against detention and deportation alongside people who are not as well known as Victor and Marian. This week we’ll be meeting to discuss what kind of alliances we need to make in Sheffield to maintain this momentum. But right now, I’m going downstairs for some carrot cake. 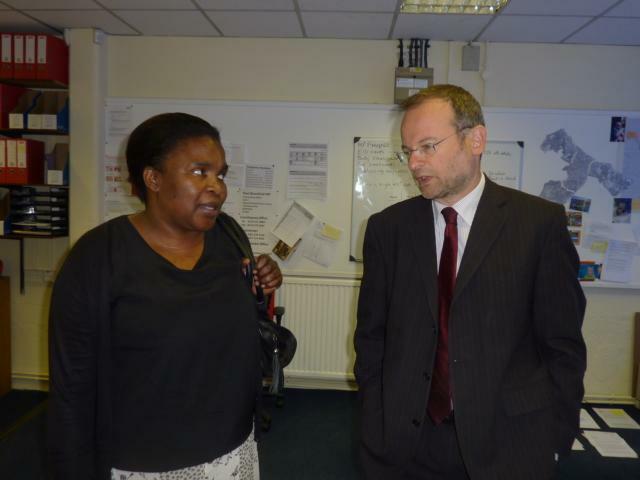 At Vulcan House, Sheffield the Home Office invited representatives of the Zimbabwean government to ask questions of Zimbabwean refugees in the UK. This was naturally a very distressing experience for people here because they are escaping Zimbabwean government violence. People who were at Vulcan House today said they wanted to demonstrate our opposition to these threats. This has happened at other Home Office buildings in the UK and appears to be part of a “redocumentation” process to make deportation to Zimbabwe possible. The UK government has had an uncritical relationship with the new Zimbabwean government of Emmerson Mnangagwa and discussed the possible deportation of 2500 Zimbabwean refugees from the UK. The fact that a Zimbabwean Embassy official was invited – without a Home Office rep being present – to question Zimbabwean refugees suggests a close relationship between UK and Zimbabwean authorities. This relationship was described as “corrupt” by one Zimbabwean woman who was questioned by the Embassy official (who refused to give his name) today. Zimbabwe is still not safe. No deportations to Zimbabwe. Stop Home Office and Zimbabwean Embassy intimidation of asylum seekers. It contains detailed information and signposting on the asylum process, legal support, accommodation, health, finance, education and much more. The site needs constant updates to keep it useful. If you have any comments or feedback, or if you spot any gaps or errors, please contact admin@sheffield.cityofsanctuary.org. A recent investigation by John Grayson and Violet Dickenson of SYMAAG revealed that Sheffield City Council are treating homeless asylum seeking children unlawfully and disrespectfully. These children and families have No Recourse to Public Funds (NRPF) and are being placed by the Council for long periods in unsuitable and potentially dangerous Bed and Breakfast accommodation. 2) To immediately stop placing homeless lone mothers and children (in particular survivors of trafficking and/or domestic violence) in potentially unsafe temporary emergency accommodation with single men. Councillor Drayton in the Council meeting and afterwards did not give any undertakings on any of these points and talked of ‘monitoring’ and refused to stop using the Earl Marshall for families. Now Sheffield City Council has finished the long break for elections, SYMAAG will be back at the Council meeting at Sheffield Town Hall Wednesday 4 July at 2pm to ask further questions to force the Council to treat homeless asylum children with NRPF just like any other homeless children in Sheffield. We invite you to come with us. Ask the Council a question from the public gallery and lobby your councillor. We’ll be meeting at The Sanctuary, Chapel Walk at 1pm beforehand. A Manchester asylum hostel run by Britain’s biggest outsourcer Serco is riddled with cockroaches, rodents and bedbugs. Mothers with babies in a Manchester hostel run by Serco have shown us their dirty and dangerous living conditions. Last week I visited the ground floor and basement of the hostel that is home to three mothers and three children. One mother, Carole, showed me the damp basement where she lived with Nathan, her 11 month old son. She showed me water gathered by the dehumidifier that she had bought. She said Nathan is asthmatic, and showed me bedbug bites on his arms. “I have them too, Serco said they could not find them, but they did not change the mattress — just put plastic on it.” That looked to me unsafe, and a suffocation risk. From the bin Carole produced a glue trap with a dead mouse and cockroaches. Upstairs Pamela, from south Asia, grimly joked about the cockroaches, “I have the really big ones up here,” she says, and it’s true. A squalid rear yard, strewn with refuse is no place to play. Serco accommodates nearly 15,000 asylum seekers in more than 5,000 properties across the North West of England, Scotland and Northern Ireland. According to the Home Affairs Committee Inquiry into asylum housing Serco housed 8,342 asylum seekers in the North West of England in September 2016, including 994 in Manchester. This suggests that they manage between 200 and 300 asylum properties in the city. In evidence to the same inquiry Serco revealed its average income per service user in February 2016 was around £300 a month. So, for the three rooms in the Manchester hostel with a mother and child in each Serco received £1800 every month of taxpayers money, £21,600 over twelve months. Security company G4S and Clearsprings also provide accommodation under the contracts known as COMPASS (Commercial and Operating Managers Procuring Asylum Support). 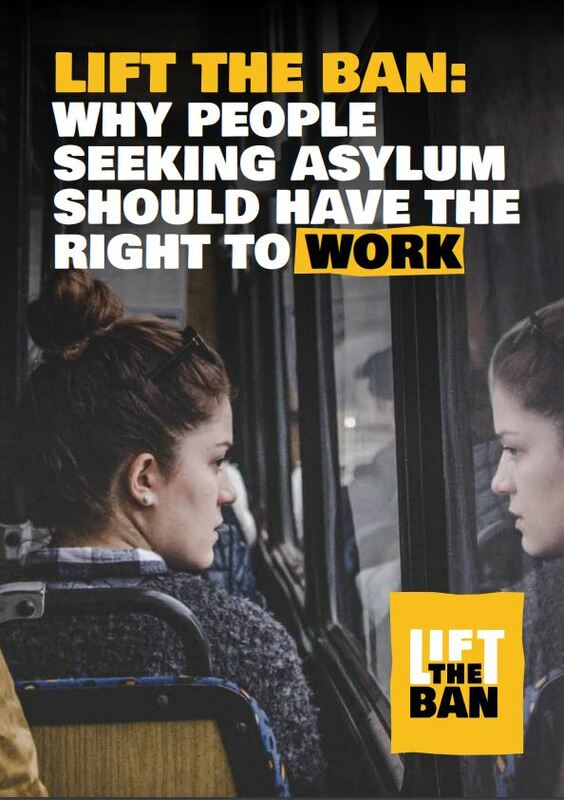 I’m a housing academic and volunteer working alongside asylum seekers. Over years we have exposed the landlords’ failures and mismanagement. Reporting here on Shine A Light, we’ve exposed health hazards, intimidation, and fire risk. This work has helped to provoke and inform a National Audit Office Inquiry and Parliamentary scrutiny. Three years later, in January 2017, MPs reported that the contractors were still failing. “Some of the premises used by Providers as temporary accommodation are substandard and unfit to house anyone, let alone people who are vulnerable,” MPs said. They warned that people were being moved around the asylum system without their consent, which can “disrupt vital support networks” and “cause emotional distress”. And they said the complaints system wasn’t working — asylum seekers feared complaints would prompt reprisals. The contractors carried on failing. In November 2017, the Guardian reported charities’ claims that in Greater Manchester, asylum seekers wereforced to live in “squalid, unsafe, slum housing conditions” and the public was largely unaware of the conditions into which “traumatised people are routinely dumped”. Serco’s origins are in defence and military procurement. Its joint venture with Lockheed Martin and Jacobs Engineering holds the government contract to design, manufacture and maintain the nuclear warheads for Britain’s Trident missiles. For more than 10 years, Serco has managed Yarl’s Wood detention centre, where guards have sexually assaulted women detainees, guards have stood by as expectant mothers undergo obstetric examinations, and where a case of child sexual abuse went uninvestigated. Serco is tendering for the new asylum housing contracts from 2019 worth a potential £4 billion of taxpayers’ money over seven regional contracts over ten years. I am not sure Carole and Pamela would agree.